Petplan Australasia Pty, Ltd. authorises you to print, copy, reproduce and download materials on this website, subject to the material being used exclusively for personal use, and the material not being modified in any manner. Apart from any fair dealing for the purpose of private study, research, criticism or review, as permitted under the Copyright Act 1968 (Cth), no part of this website may be reproduced without the written permission of Petplan Australasia Pty, Ltd.
Printing, copying, downloading, reproduction or distribution of material from this website for commercial use is expressly prohibited without Petplan Australasia Pty, Ltd.'s prior written consent. This agreement is effective from your first use of this website until terminated by you or Petplan Australasia Pty, Ltd. You may only terminate this agreement by unsubscribing to all services provided by Petplan Australasia Pty, Ltd. on this website and destroying all materials obtained from this website, all related documentation and all copies and installations thereof, whether made under the terms of this agreement or not. 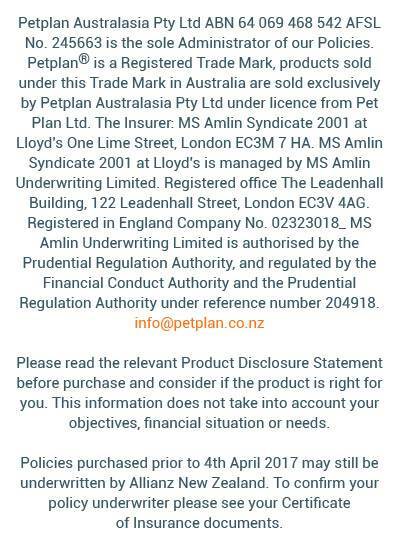 This agreement will terminate immediately, with notice from Petplan Australasia Pty, Ltd. if, in Petplan Australasia 's sole discretion, you fail to comply with any term or provision of these terms and conditions. Upon termination, you must destroy all materials obtained from this website and unsubscribe from all services provided by Petplan Australasia Pty, Ltd. on this website. If you have any questions or concerns please contact Petplan Australasia Pty, Ltd. directly at info@petplan.co.nz.